Track your investments in real-time with in-depth data, including: current value, book value, and unrealized gain or loss. Streamline accounting processes by easily recording investment purchases along with any associated broker fees and commissions. Eliminate the need for maintaining investment amortization tables for your fixed income investments purchased with a premium or discount. Define your own cost-valuation method: LIFO, FIFO, high-cost, low-cost, or a specific lot to automatically adjust your portfolio value when selling equity investments. Manage the full investment cycle, from: purchase, dividends, interest revenue, to sale or investment maturity. Eliminate redundancies and increase the accuracy of reporting by managing your investment accounts directly within Microsoft Dynamics GP. Easily get a snapshot of your account balances or account activity with the Account Balance and Account Register reports. Enhance internal controls with the ability to reconcile your investment account with your broker’s statement at any time. Quickly and accurately view your company’s overall investments position using the real-time revaluation utility. Get deeper analysis of your financial investments with the Investment IRR calculator. Easily define and report on any individual investment class, such as Small Cap, Emerging Markets or Fixed Income, to gain a deeper insight into the performance of your investments. Full integration to Microsoft Dynamics GP allows you to take advantage of Microsoft Business Intelligence tools to get deeper visibility of the performance of your investments. 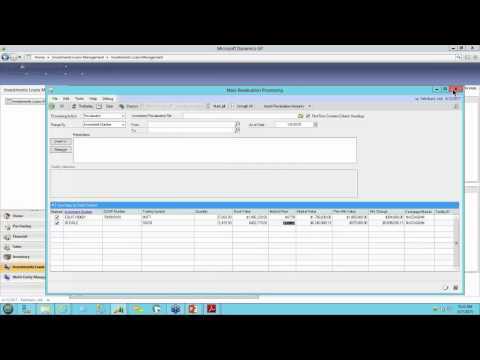 Seamless Integration to Microsoft Dynamics GP. Investment Management is built in Dexterity, the native programming language of Microsoft Dynamics GP. With the same look and feel as you are used to in Dynamics GP, training time is minimized. Manage investments for multiple entities? Investment Management’s tight integration to Multi-Entity Management allows you to assign transactions to different entities without the hassle of logging in and out of different databases. Upload investment cards, investment transactions, and brokerage activities from an Excel file directly into Dynamics GP. Update your investments’ market value directly from any major North American stock exchanges website. Automatically update your investment portfolio based on real-time market value. Revaluate your equity-type investments and post unrealized gain/loss journal entries for hundreds of investments instantly. Accrue interest revenue for your fixed income investments such as bonds, treasury bills, certificates and deposits. Automatically amortize your fixed income premium or discount on a straight-line basis every time interest is received or accrued.